I caught up with some shows that have been on the PVR for a while, including a Community episode from a month or so ago called Foosball and Nocturnal Vigilantism. The best moment was an anime sequence of two of the characters, but the best line went to an obnoxious German student who, after humiliating Jeff, says, "I wish there was a word to describe the pleasure I feel at viewing misfortune." What a shame if this show gets yanked for good. "The only good font is the Sopranos one where the 'R' is a pistol." - Tom Haverford, as played by Aziz Ansari, on Parks & Recreation. How perfect is that? One line that combines my interests in typography, The Sopranos and Parks & Recreation. "You have your fans, I have mine. Some day, your fans are going to work for my fans." - Alex, the brainy middle child in the Dunphy family on Modern Family, to her older sister, explaining how she charmed the local nerds.
" 'See you in hell Sheldon.' The most frightening thing about that is the missing comma." "Scrute Farms is very easy to find. It's right in the middle of the root vegetable district. If the soil starts to get acidic, you've probably gone too far." "I am a huge Woody Allen fan, although I have only seen Antz." - Michael Scott, in the episode Threat Level Midnight from this season of The Office. I've been catching up on the winter and spring run of the latest Office season; this one is from Steve Carell's Michael, as he reacts to a poor reaction to his long-long-long-in-the-works handmade movie. Jay: What the hell are those? Phil: Onion goggles. No more tears when I cook. Welcome to the 21st century! You should get a pair. Jay: I was going to suggest the same thing. "You want to cancel the only show on your network to star a 42-year-old woman, a show that is No. 1 in its time slot among men 18 to 49 ... months left in prison." The Big Bang Theory is not only a prime-time show that delves into things like string theory, it also wades into theology and science and how the two often do not intersect. Except when you're winning at bowling, that is. "Do you know what the business model is in the entertainment industry? Make 10 shows and hope that one of them works. We produce more failed pilots than the French air force." "Apparently Wills is marrying a Muggle." "It was reported that Kate Middleton will have six hairstylists helping her on her wedding day. If I understand the role of “princess” correctly, all of those stylists will be cartoon bluebirds." "If I ever go to the Balkans, I'm going to bring some serious cheat codes and walkthroughs." - Abed (Danny Pudi) on Community, reacting to a revelation that a classmate who liked shoot-em-up videogames also liked having actually shot 'em up in his home country. "This is the woman who handed Yo-Yo Ma her drycleaning." "Licking an envelope is a sin, unless you're married to it. So I had to marry each envelope, and then divorce it." "Uncle Jake punched the mayor and a couple of other things happened. But they got on all right." - Tinny, played by Marthe Bernard, in the Republic of Doyle episode "Don't Gamble With City Hall" that aired this week. One of the best plot summations ever, no? My favourite line from last week's Modern Family involved Manny, just after he disconnected the karoake machine that caused sonic torture. (It helps to know the line is said to his aging stepdad, Jay: "You keep this up, and this won't be the last plug I pull." "I can talk to animals. Well, not talk to 'em. I can take commands from them." This line, from Jack McBrayer's Kenneth, aired on last month's 30 Rock episode Operation Righteous Cowboy Lightning, which I got around to watching tonight. Many of Kenneth's lines are throwaway bits or comic beats, but McBrayer makes them sail. Brilliant. 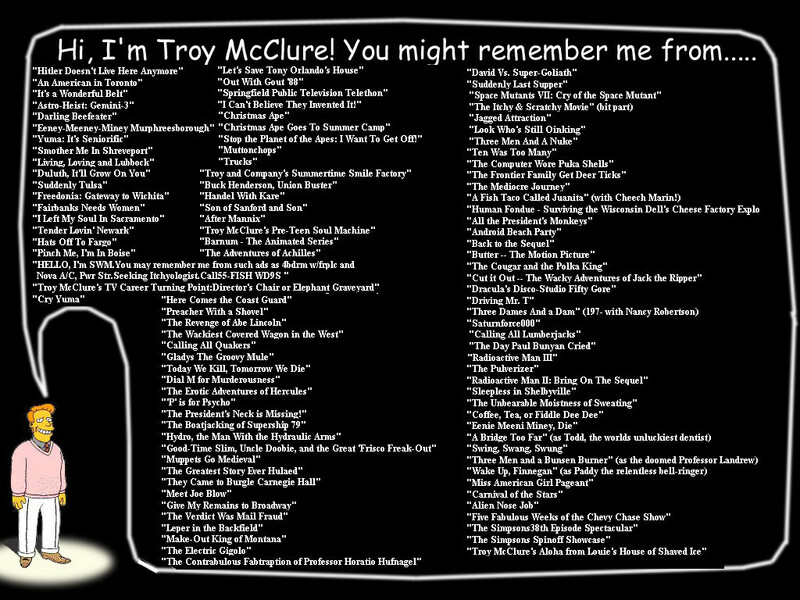 And what a reminder of what we lost in Phil Hartman's murder, and the retirement from The Simpsons of Troy McClure and Lionel Hutz. As seen here.